A stunning historic building in Old Montreal, Quebec is the Montreal City Hall which has been designated as a National Historic Site of Canada. Under the blue sky surrounding Old Montreal, Quebec in Canada, stands a historic building, the Montreal City Hall which is still used by the mayor. Five stories of architecture created by Henri-Maurice Perrault and Alexander Crowper Hutchinson between 1872 and 1878. In 1922, a fire destroyed the interior leaving only the outer walls standing and a new building was created inside this shell. A beautiful fountain adorns the grounds of the Montreal City Hall where people sit and relax. Montreal City Hall (Hotel de Ville) and fountain in Place Vauquelin along Rue Notre-Dame, Old Montreal, Montreal city, Quebec, Canada. 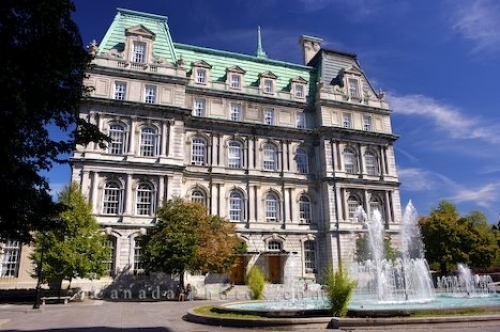 Picture of the historic building which is home to City Hall (Hotel de Ville) in Old Montreal, Quebec in Canada.